Currently, HTML5 supports three types of video formats and they are MP4, WebM, and Ogg. Among the three, MP4 is compatible with all major browsers. You can provide multiple video sources using the <source> element. The browser will choose the first supported format. The attributes 'width' and 'height' defines the width and height of the video. Providing these values will prevent possible flicker at the time of loading. The 'controls' attribute adds the default media controls, such as play, pause, volume slider, fullscreen, etc. to the video player. Older versions of browsers doesn't support html5, in which case, the text added between the <video> </video> tags will be displayed. The 'autoplay' attribute will start the video automatically. Including it, the video will be played automatically on page load. HTML5 provides several DOM properties, methods, and events for the <video> element. You can use them to define custom video controls. 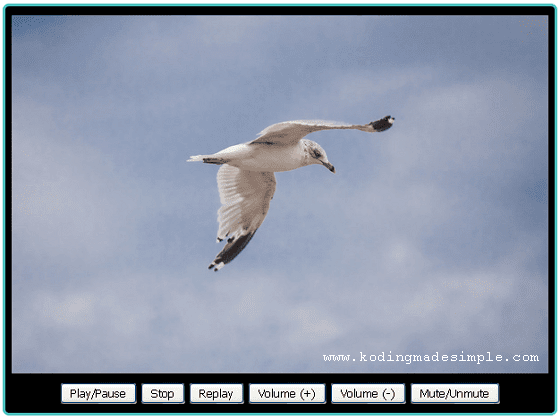 Below I have created markup for video player with controls to play, pause, replay, stop, volume up/down and mute videos. Next, add some css styles to make the player look good. The demo uses only simple buttons but, it's up to you to style them with images. Using bootstrap glyphicons or icon fonts like font-awesome is better suited. You can scale them according to your liking. That's it. We have everything in place. Now run the file and you can see a nice html5 video player with custom control buttons at the bottom. Please note that, the demo is just the place to start with. 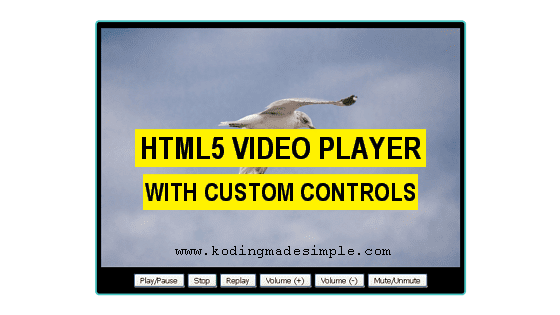 You can build a much more enhanced video player using the DOM properties of HTML5 video element.